It’s the sort of Triumph you could picture Steve McQueen riding. Beefy forks and brush-guards. This thing means business. Back when the Bonnie was air-cooled, Triumph’s Scrambler 900 was arguably the coolest retro of the lot. It looked great, it could shift on the road and at the time it was the only model with a 270-degree crank, so it sounded the best too. When Triumph relaunched the Bonnie with the 1200cc water-cooled engine, the Scrambler became the Street Scrambler and took the less powerful engine from the T100 line. 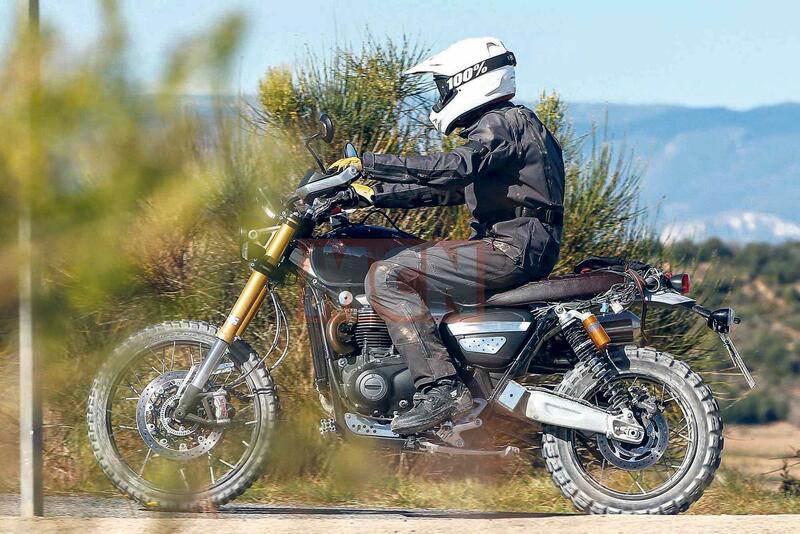 Now spy shots show Triumph are working on a new model with heaps more power, loads of suspension travel and proper off-road capability. The engine in the new Scrambler is expected to be the high-torque version of their 1200cc twin, as fitted to the Bobber. That means we can expect 76bhp and a whopping 78ftlb of torque, compared to the 54bhp and 59ftlb of the Street. The eagle-eyed may notice that the engine looks the same as the unit in the current Street Scrambler, however we can’t imagine Triumph going to all this effort to use the same engine, so we believe it’s just to help disguise it. Bigger brakes are the dead giveaways when manufacturers test more powerful bikes and this one has twin Brembo monoblocs rather than the single twin-pot on the Street. With all that power it’s going to be serious fun; a proper hairy-chested man’s scrambler – the sort of thing Steve McQueen would have ridden. It may even come with a bottle of Old Spice, or a box of Havanas. The current Street has a ride-by-wire throttle, along with ABS and traction control but we expect the 1200 will build on that with riding modes and quite possibly an off-road setting that gives you the opportunity to ‘get a bit loose’. The other big change is in the suspension. The Street Scrambler has conventional forks and twin shocks with 120mm of travel, which isn’t very much once you start hitting the rough stuff. By contrast the Scrambler 1200 has long travel Showa USD forks and Öhlins twin-shocks fitted to a new lengthened swingarm. We estimate the new model will have 200mm of suspension travel, which would put it on par with most adventure bikes and make it considerably more capable off-road. 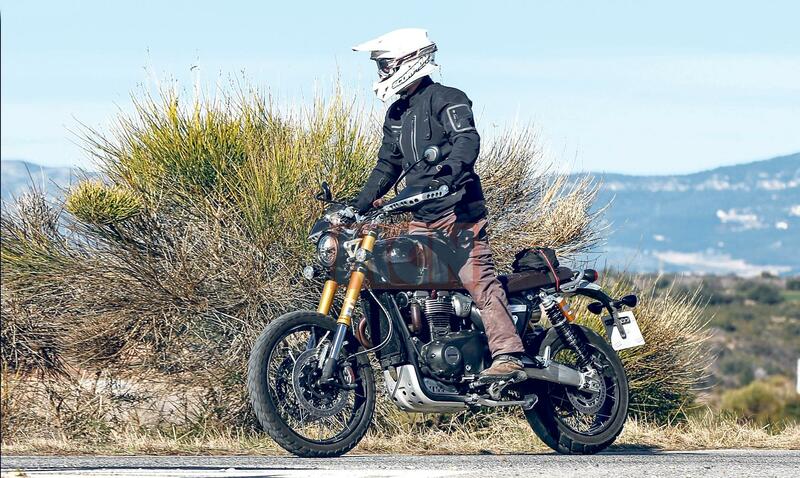 The downside to this is that it will raise the seat height considerably – in fact one of the photos shows the test rider struggling to get his feet down. The suspension isn’t the only change to favour a life off the beaten path. 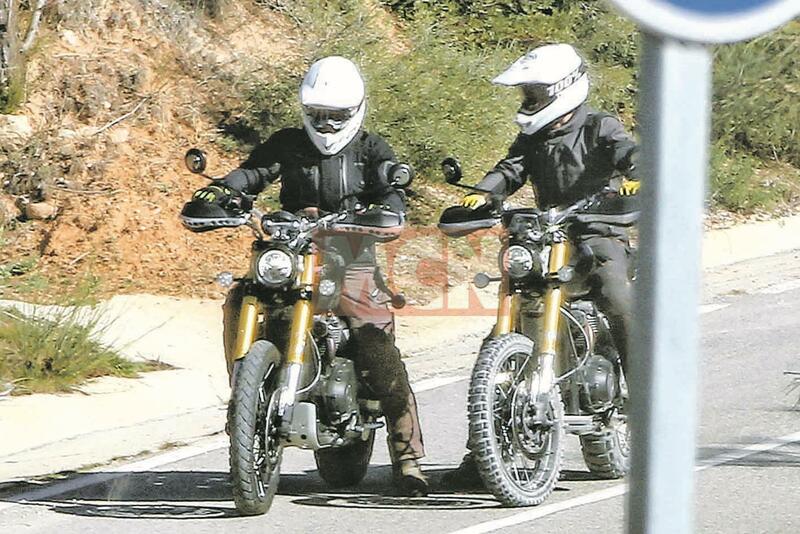 The current Street Scrambler has a 19in front wheel whereas the 1200 Scrambler will have a 21in front. A 21in front will improve the bike’s ability off-road, albeit at the expense of stability on tarmac. Interestingly, the wheels on the test bikes are not like anything in the current range; they’re spoked but the spokes run to the edges of the rims, so you can still fit tubeless tyres. There are other off-road nods too such as the reinforced handguards, large engine bash-plate and brush-guards on the bodywork to prevent damage from off-road boots. The styling has remained classically Triumph, with the quilted leather bench seat, minimalist LED headlight and small analogue clocks. There are some elements clearly missing, such as a front mudguard, but the whole bike looks close to being finished. Slow down: Twin Brembo monoblocs are the key indicator that this bike is designed to go fast. 21in front wheel points to the new Scrambler 1200’s off-road potential. Carry that weight: USD Showa forks and Öhlins twin-shocks mean it should have plenty of suspension travel for when the going gets bumpy. Again hinting at off- road ability. Bad boy: We expect the new Scrambler to take the 1200cc water-cooled high torque engine from the Bobber, giving it loads of shove without being too revvy. Considering their size, Triumph have been very busy the last few years releasing 17 new models in 2018 alone. For that reason, we’re not expecting the firm to surprise us and release the Scrambler 1200 imminently. We think a realistic estimate is an unveil in November this year at EICMA, followed by a production release in 2019. As for price, we’d expect the Scrambler 1200 to be around £12,000 when it hits dealers, so the same price as a similarly specced Thruxton R. We contacted Triumph about the photos and they chose not to comment. It’s the sort of Triumph you could picture Steve McQueen riding. Beefy forks and brush-guards. This thing means business.